Online betting firm Paddy Power has defended its latest advert after it cooked up a storm on Twitter. The firm posted a picture of a lorry at Dover with an advert featuring prominent British sports stars such as Andy Murray, Mo Farah, Raheem Sterling and Manu Tuilagi along with controversial captions. The idea was devised in-house to coincide with the start of Wimbledon. In typical Paddy Power style it was linked to a topical event, in this case the ongoing immigration crisis across Europe. 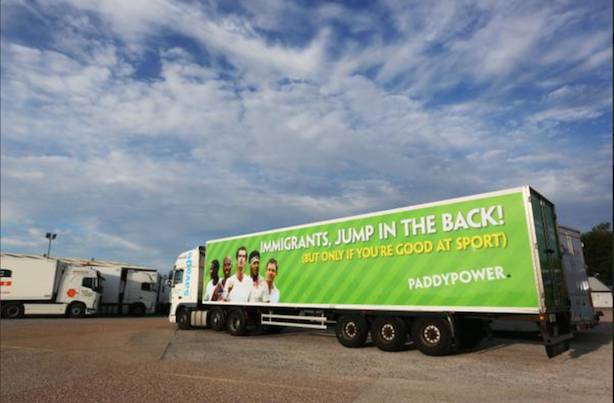 Rory Scott, head of UK PR at Paddy Power, told PRWeek the firm did not set out to offend or upset anyone but equally that it had "no regrets" over the advert. He said: "Humour is subjective and I’m sure many people feel offended at the jokes on ‘Have I Got News for You’, for example. What’s going on in Calais is topical, but this wasn’t an observation of that crisis. This was more of a gag about some of our leading British sport stars. "We were playing on the joke that Andy Murray is Scottish when he loses and British when he wins." The tweet was favourited and retweeted thousands of times by Paddy Power followers and at the time of writing it 'pinned' to the top of the @paddypower account to ensure maximum exposure. Comments were split down the middle, with as much praise for the ad as there was criticism. @paddypower This is foul. Crass even by Paddy Power's own low standards. @paddypower is there no limit to our quest for money? Profiting from human misery, how do you sleep at night? @prweekuknews @paddypower A step too far. Especially if any of those people were born in the UK. @prweekuknews yes, far too far. This is not the first time Paddy Power has carried out this type of stunt. Before the 2015 general election, it parked a lorry outside of the Houses of Parliament with the message "You’re getting sacked in the morning" directed at David Cameron.